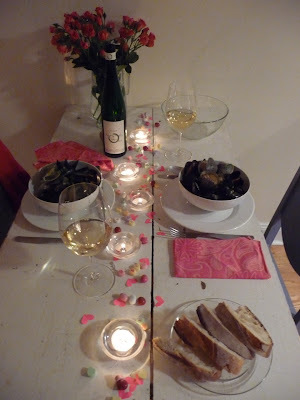 Dinner at home can be so romantic. Especially if you're like me, and you want all the details to be handmade and special. 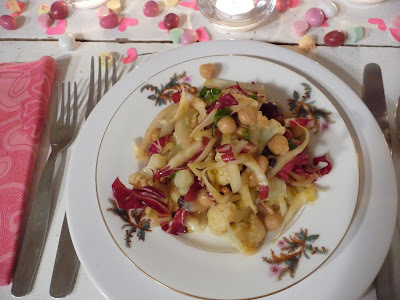 For a romantic at-home Valentine's Day dinner, let me stress: Details. It doesn't have to be anything fancy or time consuming (believe me, mine weren't: colored paper and m&m's). Just something personalized and fun. I kept the same color scheme of bright pinks and white as I had at breakfast. Cut out paper hearts, pink and white m&m's, and of course the necessary Conversation Hearts twinkled happily among the tea candles. (Try having a conversation only using the phrases on the conversation hearts.... Very tricky!) 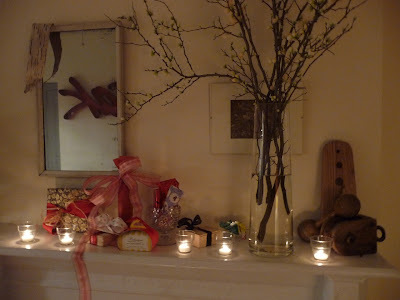 I displayed the festively wrapped gifts on the mantle, and adjusted the various lamps for a low and romantic glow. 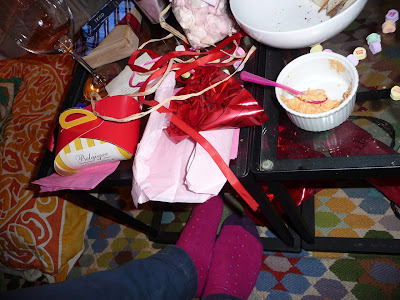 After dinner we opened our gifts, and since we were home and unshod, complimented one another on the festiveness of our Valentine socks.